Microsoft first Lumia device dubbed as “5x5x5” smartphone with the new Lumia equipped with 5-inch qHD screen (960 x 540), 5-megapixel front- and rear-facing cameras, and 5 integrated Microsoft services: Skype, Office, OneDrive, Cortana, and OneNote which allows users to stay connected and enjoy services on the move, ideal to enhance your digital lifestyle. Microsoft Lumia 535 is 3G capable and comes in two variants: 3G single SIM or 3G smart dual SIM, both loaded with Windows Phone 8.1 and the Lumia Denim update. In addition, the phone also powered by a Snapdragon 1.2GHz quad-core processor, 1GB of RAM, and 8GB of internal storage with the option to expand memory up to a maximum of 128GB. 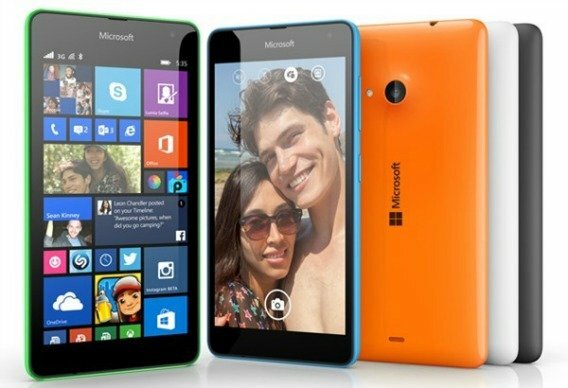 Microsoft Lumia 535 will be available in 6 colours: green, blue, orange, white, dark grey, or black. However, there is no word on price and carrier availability date.